“Our data indicates that Pink Roses are sure to make mom happy,” said Jeremy Reid, Founder and Chairman of PINCHme. What mom doesn’t love flowers? After April showers have cleared, Moms across America are getting ready for flowers to bloom. When it comes to Mother’s Day, you want to give mom the perfect bouquet. PINCHme hand-picked over 18,000 of its members from across America to find out which flower and color they wanted to receive on Mother’s Day. PINCHme is a revolutionary website that lets members try products from the world’s leading brands completely for free, in exchange for their feedback. PINCHme members share their feedback on the PINCHme platform as well as on social media. Roses took the number one seed as America’s favorite flower – with 25% of votes. Lilies, Tulips, Orchids, and Peonies followed with 13%, 11%, 10%, and 7% of the votes respectively. With so many beautiful colors to choose from, the survey also asked members which hue they prefer for their special bouquet. Pink is always pretty in this case – with 28% of votes as America’s favorite flower color. Purple came in close second with 26% of the votes and the third most preferred flower color was red, with a tally of 11%. 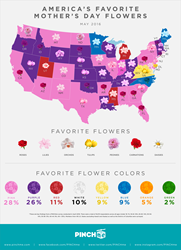 The America’s Favorite Mother’s Day Flowers infographic breaks down favorite flower and color preference by U.S. State. Florida moms indicated a preference towards Roses (27%), whilst Orchids and Lilies also ranked highly with 18% and 13% respectively. Color preferences in the State included pink at 27%, purple at 26% and white at 12%. The DC Metro Area, in particular, prefers Roses (23%), Lilies (13%) and Tulips (12%) and has a color affinity for pink (26%), purple (25%), and red (12%). Pennsylvania moms also prefer Roses, Lilies, and Tulips, with a breakdown of 22%, 15%, 11% respectively. The colors most desired in the Keystone state are pink (26%), purple (25%), and white (12%). PINCHme.com is a revolutionary website that offers consumers free products from leading beauty, food and other household brands in exchange for their feedback. No credit card or payment of any kind is required! Members just log on and choose from a selection of the products on offer, which then arrive by mail on their doorstep a few weeks later. Members just need be sure to complete short feedback surveys on each product a few weeks later! Launched in 2013, PINCHme works with leading packaged goods companies such as P&G, L’Oréal, Johnson & Johnson, Nestle, Kellogg’s and Kraft, who’s products are found at most supermarket, pharmacy and department stores. PINCHme helps these companies gain product feedback and other rich insights from their ideal target consumer audiences, as well as generate social media buzz and drive user generated content, all designed to increase their bottom line sales. PINCHme's highly engaged community of more than 2 million members is comprised predominately of female millennials who are the primary shopper in the household. Members are required to complete detailed personal profiles which allow our brand partners to micro-target particular segments of the community for digital promotions and sampling campaigns. Want to find out more? Please visit http://www.pinchme.com. *These are key findings from a PINCHme survey conducted in April 2016. There were a total of 18,313 respondents across all ages (Under 18: 1%; 18-24: 16%; 25-29: 14%; 30-34: 14%; 35-39: 13%; 40-44: 9%; 45+: 33%). Members from 48 U.S. States (excluding Hawaii and Alaska) as well as the District of Columbia were surveyed.